A doctor who appears to have been the intended target of a former physician who started shooting at a New York hospital, killing one person and injuring six, said he has no idea why he would have been singled out. Dr. Kamran Ahmed told the New York Post he wasn’t the only one Dr. Henry Bello had a problem with. 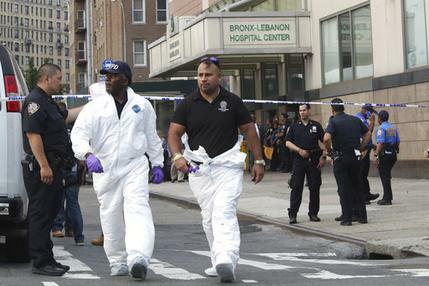 A law enforcement official told The Associated Press that Bello arrived at Bronx Lebanon Hospital in the Bronx on Friday with an assault rifle hidden under his lab coat and asked for a specific doctor whom he blamed for his having to resign. The physician wasn’t there at the time. The official spoke on the condition of anonymity because the person was not authorized to discuss an ongoing investigation. Authorities said Bello went to the 16th and 17th floors and started shooting anyway, killing Dr. Tracy Sin-Yee Tam, 32, who, like him, was a family medicine doctor. Hospital officials said that Tam normally worked in one of the hospital’s satellite clinics and was covering a shift in the main hospital as a favor to someone else. Before the shooting, Bello sent an email to the New York Daily News, blaming colleagues he said forced him to resign two years earlier. His former co-workers described a man who was aggressive, loud and threatening. Bello had warned his former colleagues when he was forced out in 2015 that he would return someday to kill them. “All the time he was a problem,” said Dr. David Lazala, who trained Bello. When Bello was forced out in 2015, he sent Lazala an email blaming him for the dismissal. Of the six others who were injured, one remained in critical condition Saturday and the rest were stable, hospital officials said Saturday. A call Sunday to the hospital for an update was not immediately returned. Bello is dead from a self-inflicted shot. Detectives searched the Bronx home where he was most recently living and found the box where the gun came from. Investigators were checking serial numbers and trying to determine where it was purchased. Next WATCH: True Believers: First Baptist Dallas Church Choir Sings “Make America Great Again” Song at Trump Rally in D.C.